Eating disorder in-patients who participated in one or more drum circle interventions experienced a highly statistically significant increase in positive affect (emotions and feelings), and a highly statistically significant decrease in negative affect, after the interventions. 40 one-hour drum circles were held for this program which took place between June 2010 and March 2011 at St. Paul’s Hospital in Vancouver, Canada, in the In-Patient Eating Disorders Program. The 79 individual patients involved (in a total of 204 drum circle interventions) used the validated PANAS (Positive and Negative Affect Scale) to rate, on a scale of 1 – 5, ten positive and ten negative emotions before and after each drum circle. The hypothesis was: “Drum Circle participation increases the positive and decreases the negative emotions and feelings in eating disorder patients”. 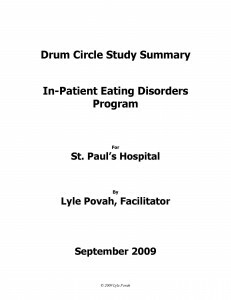 Lyle Povah has been leading a Drum Circle Program at St. Paul’s Hospital in the In-Patient Eating Disorders Program since 2006, offering an initial 4 week pilot series, then a 3 month program in 2007 (see program evaluation below), a 6 month program in 2009 (see study summary below) and most recently a 10 month program, which was completed in March 2011. Specialized protocols and Drum Circle facilitation techniques continue to be developed which are specifically designed for the eating disorder patient population. I am the leader of ‘Drum Talk – African Drumming for Creativity, Passion and Healing‘, a Haven course that allows us to explore aspects of who we are through drumming and music, and then further assists us in uncovering the joy of an innate ‘musicianship’ that is our natural birthright. I say ‘uncovering the joy’ because I believe it is only temporarily inaccessible and simply needs the right conditions to re-emerge. While this work has always been about building community, enhancing health, deepening faith, exploring creativity and moving into the true expression of ourselves, I now subscribe primarily to the simple notion that if we are open to it, playing music, singing and drumming together uncovers joy. Joy is like the yeast in the bread – when it is part of the mix, all the other elemental components are able to rise up together fully expressed. 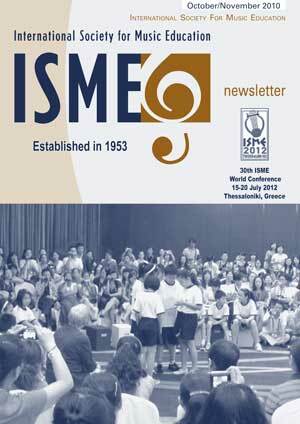 The article “HOME AWAY FROM HOME – creating a nurturing musical environment for children in hospital settings”, written by Lyle Povah, has been published in the Oct/Nov 2010 issue of the International Society for Music Education newsletter. Please click on the image below to see the article. “DRUMMING AND SPIRITUALITY” was published in “ARTS AND THE SPIRIT” and was written as supplementary material to a MusicWorks workshop at the United Church’s National Conference “LEAD 2004 – FAITH FORMATION THROUGH THE LENS OF THE ARTS” at the Banff Centre in Alberta, Canada. Please click on the image below to download the complete “Drumming and Spirituality” pdf.